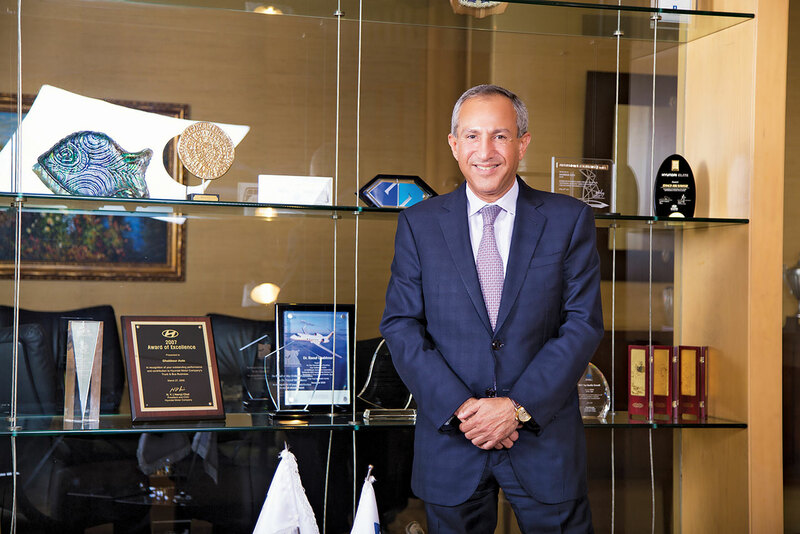 Known as a risk-taker and confident business guru, Raouf Ghabbour, the man behind Ghabbour Auto, has a success story that is an inspiration to all Egyptians. Ever since he was seven years old, Ghabbour was determined to become an entrepreneur. Rather than rely on his family’s wealth, he pursued his dream by depending on himself and his intellect. He faced many challenges along the way, and he overcame them through hard work and determination. eniGma’s Editor-in-Chief Yasmine Shihata sat with the leading businessman to find out more about his amazing journey of success. Ghabbour’s story is one of entrepreneurship, leadership, building a business, and humanity. I was seven years old when I started my first business. That was about 55 years ago. My pocket money was 15 piasters per week. Rather than spending the money, I thought of investing it. I was living in Heliopolis at the time and I went to a sweets shop called “Omar El Khayam”. I bought a quarter kilo of Basbousa with cream, cut it into portions and took it to the Heliopolis Sporting Club and displayed it at the children’s garden. It was sold out in five minutes and the 15 piasters became 30 piasters. So I went back and bought half a cake; after that I bought a full cake. By the end of the week I had made five pounds and I never asked for pocket money again. So I’ve been in business as far as I can remember! What makes a seven-year-old think of such a strategy? I always had an entrepreneurial drive inside me; not for the money, but rather for the satisfaction of accomplishing things and being successful. I was able to do all types of other businesses and didn’t want pocket money from my parents. Actually, I remember buying my mother a present from the money; and when she passed away, I discovered she had kept that present. At age twelve, I heard from a relative working at the American embassy that the embassy and Namru had a policy to sell all their AC equipment after 12 months of utilization, even though it was in good condition. I went to the auction and bought the equipment. After I bought it, I called my father and asked him to park his car on the street and to let me use the garage for storage. He liked the idea of me being an entrepreneur, so he agreed. I made a deal with an electrician to fix the old equipment and made a profit of over 500%. Of course, we don’t make those margins today! Does entrepreneurship run in the family? I am proud to belong to an entrepreneurial family. My cousin, Karim Ghabbour is the Mercedes Benz commercial distributor in Egypt. He has manufacturing facilities in Egypt, UK, India, Cuba, and South Africa and is one of the biggest Mercedes Benz commercial distributors in the world. He is also a very respectable man. My other cousin has one of the biggest distribution companies for home appliances. My father’s cousin, Mounir Ghabbour, is behind the real estate development of ‘Mirage’ and he also has an insurance company. So we all have that kind of entrepreneurial mindset. I started in my father’s business, as did both of my cousins. We split after my father passed away 20 years ago. So we are the second generation. How long did you work in your father’s business before the split? I worked in my father’s business since the beginning of 1977 until 1990. By 1985, I was the CEO of the company at the young age of 35. In the same year, I also established my own company as a side business, while still being the CEO of my father’s company. In 1990, I resigned from the family business, because my own business was growing and I didn’t have time to balance my work in both companies. When I left, I was already very successful in the tire business, spare parts, electronics, and home appliances business. In addition, I had a training and manufacturing facility, a bus body manufacturing facility , and an agricultural project. I told my father I would focus on my business but I would be there for him whenever he needed me and that is what happened. He passed away six years later and I came back and took over the business. How did you get into the car sales business? In 1993 a friend of mine who was working for the Hyundai Corporation told me the Hyundai Motor Company was coming to Egypt to appoint a new distributor and asked if I was interested. I said yes. He gave me a tip that they were interested in finding someone who would be willing to invest in an assembly manufacturing facility. All the big international car representatives, like Mansour, Nosseir and Sheta were also applying. So I went, made a presentation, and when they asked if I was willing to invest in a manufacturing facility, I said yes and I got the distributorship. Also, during the interview I understood they were having trouble selling buses in Egypt and I offered to sell 400 buses a year if they gave me a performance invoice right then for 100 buses. They agreed. Of course doing business requires taking risks and huge confidence. You make a judgment and then you take the risk; betting that you are right. I started by importing 1,000 cars. My father thought I was crazy, but they were all sold in a month. Getting into manufacturing was a different experience. I was always a very good trader but not an industrialist. However, since Hyundai Motors wanted that, I was okay with the change. I went into car manufacturing without knowing anything about it. It’s exactly like learning how to swim; you just need to jump. Of course you will face problems and challenges, but with perseverance and hard work and as long as you believe in your target and never give up on it, you can do it. Looking back, what would you say was your biggest challenge? One of the biggest challenges I faced was in 1981, I remember that I thought I was finished for good. With the assassination of President Anwar El Sadat, the market collapsed and I had $20 million worth of goods in stock, $50-60 million in receivables owed to me by the dealers who stopped paying, and all of a sudden the demand for my goods just died. At the same time the international price of raw material used in tires had collapsed globally, so the prices of tires started going down. I had stock in my warehouses, which I had bought at a very high price, and the borrowing interest rate for US dollars in 1981 was 18%. I was paying 18% a year and the Egyptian pound was collapsing against the US dollar. My liabilities were in US dollars and I was selling in Egyptian pounds. All the conditions were against me. I stayed in shock for a month; I realized I had made a lot of money and now was the time I had to lose a lot of it. It was a very difficult decision. I was only 28 years old and I asked myself, ‘Should I lose all my money to keep my reputation?’ I calculated my loss to be about $8 million, which was a huge number at the time. I said to myself I still have a long road ahead of me and my reputation is worth much more than $8 million. So I started to mentally accept to lose 30-40% and live with it and I did. This was an experience I faced several times in my career. I remember I used to go home every day calculating the loss of the day; I used to lose something like $100 thousand a day and I used to cry. Really cry. Then in September of 1982, my stock was cleared; I had lost my money but my payments to the banks were up to date. My supplier was watching me and was betting that I was not going to make it. Then in September 1982 I sent them an order for the first time in eight or nine months. They said the top management wanted to come see me. This got me very worried and I thought they did not want to ship to me. Then the man in top management came and told me, “Raouf, we really applicate you, you are a respectable man and we have done huge business with you. We have made a lot of money, we know that you made a lot of money and we also know that you lost it. So we are here to thank you and tell you that we want to contribute to rebuilding your financial power by giving you a 20% discount plus six months users facility. He said “this is for you and it lasts only for six months after that we will go back to our original conditions and pricing. And because of that, I made the $8 million I lost in six months. In the end, I learned that money itself is irrelevant. The most important thing is that your reputation has to be extremely good, you have to be extremely ethical and it will pay back in one way or another. In 1997 you decided to go public with your company. Can you tell us about that? In November 1997, the Luxor terrorist attack hit the Egyptian economy. In addition, the Egyptian government, after having an agreement with the World Bank and International Monetary Fund (IMF) from 1991 to 1996, felt they didn’t need the IMF and cancelled the agreement. The terrorist attacks of November 1997 happened after that. Starting in 1998, the government started delaying payments to its main contractors. These main contractors were my main customers and their subcontractors were my customers as well. So my payment collections started to suffer since 95% of my sales were on credit. Suddenly, I went from always having a 99% collection rate to one that went down to 70%. From 1998 to late the 2000s, every few months there would be another sector of the economy that would collapse. First the tourism sector, then the transportation sector, then the consumer sector collapsed. We weren’t sure what was happening. All of a sudden I found that my receivables turned into crap. In the beginning I covered for the bad collections. Then my pipeline was empty and I could not satisfy the banks.By late 1999, I was in a miserable financial situation and the net worth of the company went from a positive half a billion USD to negative 1.5 billion USD; meaning I had lost 2 billion USD. I rescheduled my debts under the supervision of the Central Bank and the Ministry of Economy. I started selling all my personal properties and putting money in the company so it gave a strong message to the bank executor. And I was very lucky, the Korean won was very weak against US dollars so the competitiveness of Korean cars was phenomenal against Japanese and Europeans cars; so I knew this was my chance. By 2007 and at the time of my IPO, I had already repaid 50% of my debt plus all the interest. I still had to pay three-quarters of a billion Egyptian pounds, and looking ahead, I needed another three to four years to pay it up. Had I not been in this distress I would never have accepted the idea of going public. But I did not want to continue paying installments of 40 million Egyptian pounds a month for the coming years. So I agreed to do a public offering and discovered that it was like the difference between day and night. Of course going public puts a lot of pressure on you, but as long as you know what you are doing and are fair to the shareholders, it really gives you opportunities to do multiples of what you can do as a closed company. I used to get an idea in my head at night and do it the next morning. This is no longer the case. I have to go to the board, convince the board, and then defend the idea in a general assembly. A super minority shareholder with ten shares can give me a very hard time. This forces me to listen to people and accept the opinions of others. As an entrepreneur, was it the hardest thing to accept that decisions are not entirely yours? No, on the contrary; at the end of the day, I will never accept an opinion that is contrary to mine unless I am convinced. And if I am not convinced I will fight like a lion. I still own more than 60% of the company and I care about my money. The rest of the board members are professional, from finance backgrounds, legal backgrounds and business backgrounds. They contribute positively to our decisions. So I do not consider that they are challenging me for the sake of it, it is a matter of them adding their experience. The business has now grown so much; you have an investment company, and a training academy, what do you feel most passionate about? It’s like having ten children; I love them all, but always the newly born is the closest to me; maybe it’s because the new business needs the most care. For example currently, we just established a microfinance company and every other day I am following up on that. Are your three children working with you? No, none of them are working with me. My first child finds the automotive business too challenging with very thin margins, so he is taking care of our agriculture project and he wants to start his own chain of restaurants. My second child was working with me up to four years ago and then she had her first baby and now she is pregnant again so, of course, motherhood is her focus now. I know it is a phase and that three to four years down the road, she will come back. My youngest child was the Chief Operating Officer of the company until October 2014, when he went to get an MBA. He should be back to work at the beginning of 2016. Do you see this as your legacy and a family business that you want to pass down to them? No, not at all, I had a very funny and strange conversation with my youngest son, who is my successor, in Houston three years ago. We went out for dinner alone and all of a sudden he told me, “Dad I can’t see myself doing what you’re doing at your age.” When I asked what he meant, he said, “I am willing to work as an executive until age of 40, but not after 40”, and when I asked him what he planned to do after age 40, he said, “manage my wealth. Do you have time to manage your wealth?” and I said no. He told me, “it is much more interesting and I don’t know how at your age you are able to wake up every day at 5 am and work 10-12 hours a day” I was surprised, but when I thought about what we talked about, I realized he was very smart. Because at the end of the day hiring the best CEO, from Europe or from America or Japan, would be more cost effective and they would be far better than me. At the end of the day we are entrepreneurs and being an entrepreneur doesn’t mean being a qualified CEO; a good CEO is a professional and an entreprenneur is not always professional, we are crazy people. So it is much safer to have a professional CEO. We are lucky because I understand the business and my son understands the business, so if I become a Non-Executive Chairman and bring in a qualified CEO, I could enjoy my life far better and I can look over so many other things and make more money and steer the company in a safer way. I am very aggressive, so I make decisions which are sometimes very risky. Do you see that happening? Yes, why not. I remember I hosted a conference in 2008 just before the global financial crisis and I said I would retire in 2013 when I turned 60. Then the revolution happened, so I was forced to stay because that was a crucial time for the business. Egypt is a very big country, regardless of the handicaps and short falls, it is bound to recover. The ones who continue believing in the potential of the country and continue investing – with money, management, HR, systems, processes- will be rewarded at some point. I hope I get to see that in my lifetime. Tell us about your CSR projects and how you are also giving back to the community. I don’t like to talk about what I do for charity, but I do so in many fields related to children, health, housing etc. I believe education is the most important factor that will contribute to the welfare of Egypt. Poor education is behind poor health and the poor economy. It is the source of all the country’s problems. Egyptian universities are producing a huge number of graduates, beyond what the market demands, with a poor quality education; while the number of technicians is very low compared to the demand, and their quality is poor as well. I currently employ 9000 people; and out of the 9000 people the vast majority are technicians. We face a lot of difficulty in hiring; that’s why I want to establish an academy for vocational education; with the goal to build a big center in a different governorate each year. We will do this in cooperation with the government, like my late wife did when she opened the Children’s Cancer Hospital. We did not pay to build the hospital until the government gave us the land. The government doesn’t have money but they have land; so I am adopting the same principle for the vocational training centers. My dream is to build a center in one to three governorates per year, so that in 10 to 15 years GB automotive can completely improve educational training in Egypt. Today we suffer from over population because our population is not qualified. But if you transform those people into qualified people, our human resources become our wealth. Let’s talk about Raouf Ghabbour, the man. What are your hobbies or interests? I wouldn’t call it a hobby, but I’ve been addicted to the gym for15 years now. In 15 years I lost 40 kilograms. I work out two hours a day. And the day I do not work out, I feel depressed, unproductive, unfit, and nervous. I wake up at 4:45 am to be at the gym at 5 am. My other interest is music. I am crazy about music. I have a very broad interest in genres from opera to modern. I love classical music, but this does not stop me from being in Ibiza and going to the concert of a crazy DJ. I go and have fun, I enjoy my time. Landscaping is another interest of mine. Friday is when I have time to do gardening. When the weather is nice, I can spend three hours on a Friday walking in the garden with my Head Gardner, talking about small changes in landscaping. I have built the best garden in Mansouria. You wouldn’t believe it is in Egypt, even the birds don’t believe it is Egypt! I have spent 30 years working on it and it has really matured now and is well maintained. Art is also very important to me. I am an obsessed art collector; I can’t stop buying art. I love the whole spectrum of art. Last but not least, I love movies. I have a movie theater at home and I regularly go through the Apple Store and check the latest movies. I always watch a movie before going to sleep. I usually have dinner while watching if I am not inviting people over for dinner. I sleep at 9:30 pm maximum. I don’t really attend social events unless I am forced, and unless it is civilized, I won’t go. And honestly I prefer to enjoy my own world at home. Ambitious, persistent, hard worker, ethical, and creative. What are your most treasured qualities? My daughter tells me I’m very kind and very generous. I go out of my way to help people. I always sacrifice my time to give the right advice to people. I am very genuine. Whenever anyone asks for advice l give it to them, even if they are a competitor; I always tell them the right thing to do. What would you would like to change about yourself ? I am too impulsive; I am like a 500 horsepower engine without breaks. I’m also too reserved; even when people get to know me socially and we become good friends, it’s difficult for me to open up. My wife used to balance this, yet after she passed away I have gone back to being as reserved as I was before. I also rarely get angry but when I do my anger is like the ocean. What qualities do you dislike in people? Lying. I also dislike weakness and passiveness. What qualities do you find most attractive? People who are hardworking, achievers, persistent, respectable, and ethical. Which book or movie has had the most impact on you? The Steve Jobs book; Jobs was an adopted child who was half Syrian/half American. He did not continue his higher education yet his creativity and drive led to enormous success. The book portrays him as a lousy character in personal life, but he influenced our lives so much, it’s unbelievable. What would the title to your biography be? Which high profile Arab do you most admire and why? Sheikh Mohamed Bin Rashid Al Maktoum. He manages Dubai like a phenomenal CEO would manage a company. I would really love to see this model expanded throughout the Middle East, because we have a lot of resources yet we manage them poorly. Wealth and money are irrelevant, the most important thing you can do is preserve your reputation. What is your biggest regret? I regret not having studied business, because I learned it at a very high cost. If you could change one thing about the Middle East, what would that be? With the exception of very few countries, the Middle East is not investing properly in education. The region has a wealth of human resources, which is truly wasted. What do you love most about the Middle East? It’s the land of opportunity. Not having time to accomplish all my plans. What would make you happy? To see my country get back on track. What is your proudest moment? The moment when any of my new ventures become successful and reaches a leading position in the market. What is left that you still want to do? I don’t feel I have achieved a lot. I am a successful distributor of cars in Egypt or the region. But this is not what I aspire to. I want to transform Egypt from a net importing country, which does not have a serious automotive manufacturing industry, into the manufacturing hub for Middle East and Africa so it becomes a net exporter of components and cars. I will feel very proud if I get to do that and if people can say Raouf Ghabbour was the founder of automotive manufacturing in Egypt and he helped transform the country from an importer to a manufacturer. A lot of legislative changes need to be happen to achieve this dream. I would have done it five or six years ago if the political will was there. The political will is there now, but time is passing and that worries me.